Apple iPad enchants gadget lovers with world-class performance and battery life. More of a priority, iPad's great ability to display high-resolution videos and photos now puts visual media front and center. So it's not at all surprising that people would rather take iPad as a portable entertainment console than a merely ultraportable tablet. Of course, video watching on iPad can be a fantastic experience. But how about those who have a burgeoning DVD collection? Have you ever wondered an easy way to import DVD movies onto iPad so as to enrich your entertainment on your upcoming road trip and help distracting kids? But how to rip and convert DVD to iPad quickly and conveniently? As a result, a DVD ripper that can convert DVD movie to iPad on Mac or PC is in urgent need. So you google and find a lot of software on the internet. But most of them are only compatible with Windows computer. For Apple addicts who are longing for a program in line with Mac platform that do the job, it's a little bit difficult. 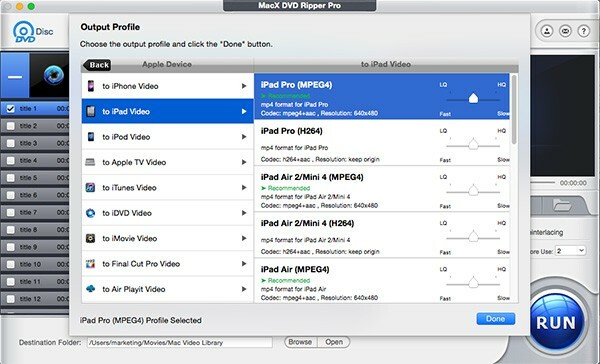 Well never mind, MacX DVD Ripper Pro is especially tailored for Mac (El Capitan/macOS Sierra) users, which allows to create backup of DVD movie and convert DVD to iPad of any generation, be it iPad Pro, iPad Air 2, mini 4, the New iPad or iPad Mini etc in a short amount of time, letting you carry your movies with you everywhere you go. Additionally, this best Mac DVD ripper for iPad is good at circumventing commercial DVD copy protection, regardless of region code, CSS encryption, Sony ARccOS protection, RCE, UOPs, Disney X-project protection from the new DVD movies so that you can feel free to load all your DVD movies and do format conversion. What's more, users can also rip DVD to MP4, MKV, AVI, FLV, MOV and various other popular formats. It gets the most thumbs ups from customers since it not only brings an immense feature set but also delivers near-perfect quality to guarantee high-quality process. You will also be impressed with the graphic-based interface and basic layout, all helping to make DVD conversion on Mac easily. Free download and run this iPad DVD converter on Mac OS X or Windows version on Winodws 10/7/XP, import DVD by means of clicking "DVD Disc" button. Alternatively, you can import this disc by hitting "DVD Folder". Simply choose "to iPad" as the output format. This program always keeps up with the newest technologies and constantly upgrades to support the newest generation of iPad. So you can feel free to convert DVD to iPad Pro, iPad Air and iPad Mini on Mac. Besides, this program also helps you convert DVD to MP4, DVD to MOV, DVD to MP3 as you desire. After finishing the above steps, start ripping DVD movie to iPad friendly format on Mac by clicking "RUN" button. For those who are desperate to rip protected DVD to more output formats for viewing on mobile devices like iPhone, iPad, Samsung, Android, etc, MacX DVD Ripper Pro will also give you a hand to finish DVD conversion on Mac at blazing speed. And for those who wanna enjoy DVD movies on iPad iPhone devices finally, MacX MediaTrans comes to resuce, helping you to transfer DVD movies to iPad for watching anywhere anytime. Use the best iPad Mini 4 DVD ripper to easily and fast rip & convert DVD discs to iPad Mini 4/3/2 compatible formats (MP4, MOV, MP3) as well as remove various copy protections like DVD CSS, region code, Disney, etc. Still seeking for the best DVD ripper to convert DVD to MP4 so that you can enjoy movies on iphone, iPad wherever you go? check the page below. Are you in search for a free DVD to iPad converter with no watermark or time limit? MacX Free DVD Ripper for Mac is the best freeware that converts DVD discs to iPad for free on Mac OS without any limitations.